Northern Jaguar Project – A binational effort to save the northernmost jaguar population » Viva Los Jaguares! Over the weeks of voting during Summit Hut’s Banff grant contest, we were consistently touched that there are so many friends of the jaguar who want to help. The excitement and enthusiasm our supporters have shown in promoting this contest and asking friends to join us to save the northern jaguar helped NJP win needed funding. We are truly grateful! Our thanks to Summit Hut for their commitment to protecting the outdoors, wildlife, and wild places and for selecting NJP as a finalist for their Banff grants. Thanks for promoting the conservation of jaguars in the U.S.-Mexico borderlands, Summit Hut! 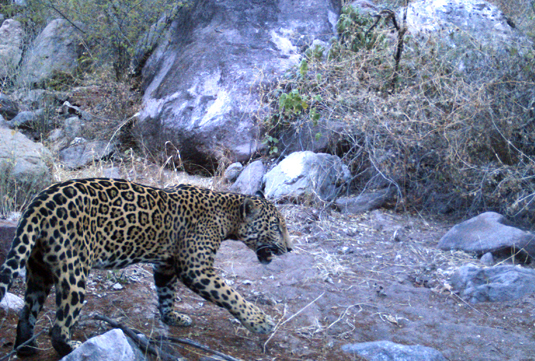 Motion-triggered camera photo of “Luisa” on the Northern Jaguar Reserve.